Ridgeville Township was first settled in 1810 by settlers from Waterbury, Connecticut. The township was organized in 1813 and remained ""Ridgeville Township"" until 1958, when it was incorporated as a village. During this time, various types of police protection, which included Constables, Deputy Sheriff's, and the State Highway Patrol, had been utilized. 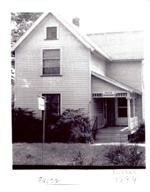 In August of 1960, the population was sufficient to allow the township to become the City of North Ridgeville, at which time a new city council was formed, and a permanent police department replaced the previous Township Constable. The first officer appointed was Emory C. Hershey, who had served as Constable from 1944 until 1959, and served as Chief of Police from 1960 until 1965. The first Patrolman, Thomas P. Richards, was appointed in October of 1959. At that time, the police department did not even have its own police car, and both Hershey and Richards used their own private vehicles as patrol cars. In 1960, the city purchased a fully equipped police cruiser and added two more patrolmen to the police force. The police Department operated out of a house on the north side of Center Ridge Road, just west of S.R. 83. 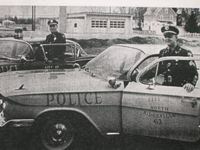 In 1961, a citizens Committee was formed, and the police department was presented with a fully equipped 1961 Chevrolet police cruiser. Prior to this officers drove their own vehicles on patrol. With the addition of a second car to the department, a new problem arose: there was no garage space for the new cars. As a result, a portion of the city garage was remodeled and utilized by the police department. In 1965 the department transitioned from a part time agency to full time. Thomas Richards was appointed to lead as Chief, succeeding Emory Hershey, who was unable to leave his full time civilian job and accept the position. By 1971, the police department consisted of a Chief, one Sergeant, one Inspector and six Patrolmen. As the city continued to grow, the police department became a full time police force, adapting and evolving with the significant growth of the city. In 1975 all city government offices, including the police department, moved into the current city hall complex. As funding and resources became available, additional personnel were hired, and equipment was updated. 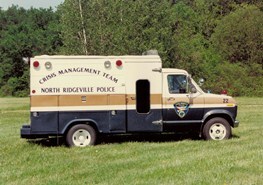 During the 1980's the department developed the Crisis Management Team (CMT) which was a joint tactical (SWAT) and hostage negotiation unit with the Avon Police Department. The CMT conducted numerous high risk warrant services, handled several barricaded subjects and numerous potential suicide incidents. 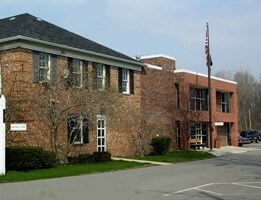 By the 1990's the police department had long since outgrown it's facilities, and in 1996 the building underwent a 1.5 million dollar addition and renovation. The construction brought the facility into ADA compliance and brought the project up to minimum standards. The renovation was certainly an improvement over the previous facility, but was only meant to be a five year solution. Today, the North Ridgeville Police department consists of 38 police officers and 13 non-sworn personnel and serves a city with a population fast approaching 30,000.These officers still operate out of the same facility. The members of the police department are proud of our history serving the citizens of North Ridgeville, and are constantly planning for the future so we can continue to provide the level of service the citizens deserve and have come to expect.